The Naked Case, a new Kickstarter project, aims to protect the new scratch-prone Jet Black iPhone 7 and iPhone 7 Plus with car-grade materials. Naked Case creator JP Richards plans to use XPEL Ultimate Paint Protection films, known in the car world as offering excellent protection from rock chips and other road abrasions, to create skins designed for Apple's newest devices. The Naked Case measures in at 0.2mm thick, and it is guaranteed to be resistant to yellowing for up to 10 years. XPEL makes highly scratch-resistant paint protection films that are able to heal themselves from scratches. Because they're designed for use on cars, the films are rugged and high quality, offering protection without causing damage to the finish or marring the look of the vehicle. Those same qualities transfer well to skins for the iPhone, and the Naked Case delivers car-grade scratch protection that will keep the Jet Black iPhone 7 looking pristine. 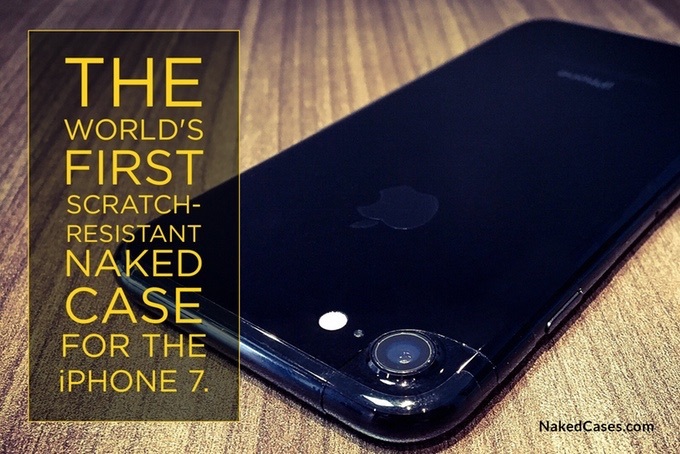 According to the Naked Case Kickstarter, while the product was designed for the Jet Black iPhone 7, since it's clear, it can be used with any iPhone 7. Naked Case has even developed a special version for the Black iPhone 7 and 7 Plus, which have a matte finish. The standard shiny finish of the XPEL film ruined the look, so for those devices, customers can order a Naked Case made from "Stealth" XPEL film designed for high-end cars with black matte finishes. It should be noted that the Naked Case isn't going to be easy to install. On cars, XPEL films are generally installed by professionals. On the iPhone, the installation process requires water, soap, a hair dryer, and a whole lot of patience. Naked Cases already has the XPEL film on hand, which will be custom cut to size for the iPhone 7 and iPhone 7 Plus at the conclusion of the Kickstarter project. Estimated delivery is listed as October, so backers should receive their skins quite soon. The Naked Case for the iPhone 7 can be ordered for $30 CAD ($23 USD), while the iPhone 7 Plus version is available for $35 CAD ($26 USD). You're kidding right? Id rather throw my phone at the floor and use it for a year looking the result of the drop that put anything like that junk on it. [doublepost=1477689521][/doublepost]"Look, its invisible, no air bubbles, you can barely see it!" Isn't that Saul Goodman's long lost brother. Glad that there are people looking for solutions, but let's be honest, a $700+ phone in 2016 should not be as scratchable as the Jet Black iPhone. They aren't actually scratches...and you do not need to choose that version...what does the year have to do with anything at all? I don't like the cut out around the camera. It'd be better if they'd done a proper cut out of just the lens shape instead of that bizarre entire edge missing and now you can see a line of the case which is much worse than the "micro abrasions" you get using it naked. I remember when iPhone 4 came out...freaking AMAZING. How could you not love a phone...made out of glass with stainless steel (not aluminum) edges. The 4S was a design marvel too (well it was a 4 on Steroids thus the S). Ever since Jobs died they made a mockery out of the iPhone design. The GALAXY S7 edge has one of the nicest designs I've seen. Too bad it's Android and not IOS. This guy speaks like Trump. Kind of sleazy and repeating, repeating, repeating, and repeating, and repeating with horrible grammar and sentence structure. As an authorized Xpel dealer & installer....... Man, what a piss poor pattern design for the cut on that. spend a little more time in the design software and create a proper fitting pattern. Also, its an easy install if you use the installation gel. Been doing this with all my phones for the longest time.